Game tonight is on ESPN+. So you'll have to pay to watch it. I'm guessing no one will do that. Another win for the Mad Ants: 122-115 vs Milwaukee Herd! Edmond Sumner with 35 points (14 of 19 shooting), Alize Johnson with 20 points and 15 rebounds, Ben Moore with 20 points and 11 rebounds. 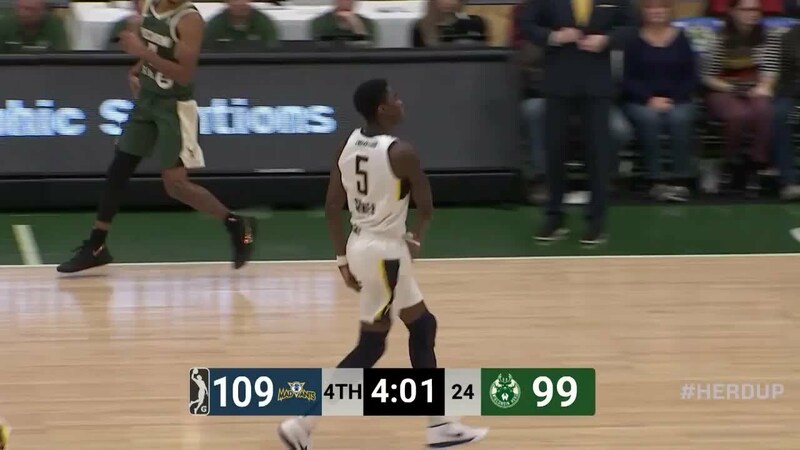 I'll say it again: I wish I were as excited about Aaron Holiday as I am about Edmond Sumner. He's got a ways to go as a team-running point guard and filling out his lanky frame, but my goodness, the talent and attention-getting athleticism sure are there. If, IF he could develop into a starter, his strengths would really help Vic and the others. Assuming the Young Guns stay in Fort Wayne for a while, I'd be up for a PD road trip to a Mad Ants game. My car's small, though; anyone with a van or a large SUV wanna volunteer to drive? TJ Leaf only played 3 games with the Mad Ants last season. Since this was Alize's 3rd game, I thought it might be fun to compare their stats. Their minutes played aren't quite the same and I couldn't find Per 36 numbers for Alize. But since Alize is averaging 36.3 minutes then his stats are essentially Per 36 anyway. So I included Leafs per game averages along with his stats normalized to Per 36. Cause why not? Edit: I don't think you can draw any meaningful conclusions from these numbers. Other than that they're different kinds of players. But I do think the age difference is important to consider. Alize has two more years of growth and development than Leaf did in his first season. Last edited by Strummer; 11-15-2018, 03:48 PM. I was happy to see Sumners hit some outside shots. However I really was happy that Ike had a couple of nice basketball plays in there as well. Nothing special but he looked less jerky in those video clips. The more I've seen, the more I'm unsure why we let Moore go. He's a fairly solid defender. Not as solid as Poythress, but he is quicker and has a more offensive game. Edmond Sumner, right up Meridian. Nate is paying attention to the Mad Ants. Says "we're going to rotate our guys" to Fort Wayne. I assume that means Holiday and Leaf could see some time in Fort Wayne. Last edited by Strummer; 11-15-2018, 03:17 PM. back to facebook live for tonight's game. Tough loss, but big performances from Alize & Edmond again, they could both be rotation players now. Realy impressed with Alize's 3pt shooting, if he can keep that up while rebounding we might have a jump shooting Faried on our hands haha. Anyone know what happened to Alize in the 2nd half? I didn't watch the game but noticed he scored 20 in the first and only 3 in the second.